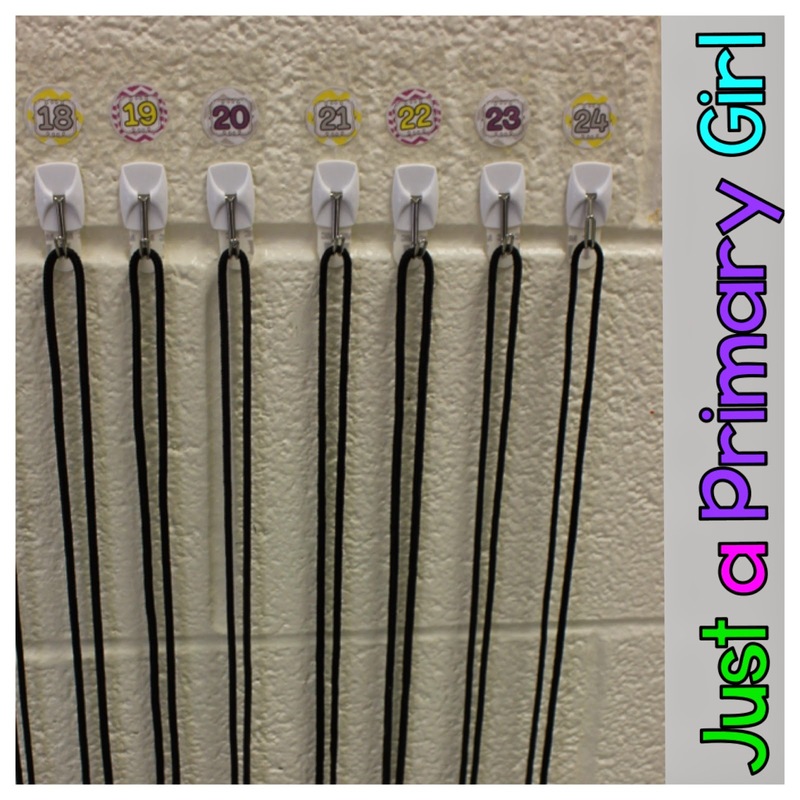 Do you use command hooks in your classroom? Oh my word! They are my best friend in the classroom! I use them for pretty much everything, and today – I am going to share a few uses. Hi I am sharing a few ideas as a part of the awesome group of bloggers that bring you Bright Ideas! I have loved reading these each month and I am so honored to be a part of such an amazing group! Have you run short on desk space? Don't have room for tables or shelves on the ends of desks? In my classroom, my students are constantly losing erasers, pencils etc. It drives me NUTS! 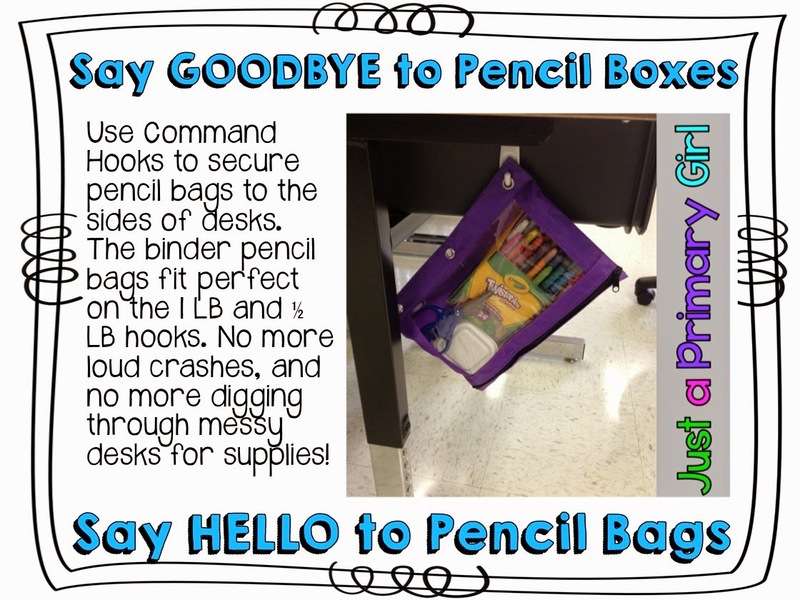 I have tried asking them to keep their pencils boxes at the front of their desks, it ends up dumping on the floor. I gave them a picture map of their desk with the box up front. Guess where it always is? In the back! There are pencils, crayons, erasers etc all over the floor. Mid lesson, guess what happens? You guessed it, seven kids from the other side of the room make their way to the floor to help clean up the spill. My favorite is when you are in the middle of asking questions and a kiddo has half their books on the floor looking for the yellow crayon that they misplaced two weeks ago. Well, I couldn’t’ take it any longer. I tried to figure out how to make it so that when the supplies fell, it didn’t make such a loud sound, and the entire class didn’t run to help. In came pencil bags or pouches depending on where you live. I found my pouches at Walmart. They were only .97 each. Most of mine were able to be washed and reused this school year, but for only a buck – I don’t mind getting new ones. They held up well with oxy clean in my washing machine. When people visit my room, they always say how much they love seeing them, but are skeptical of how much it can hold. This is what I keep inside. Every kid must have only 2 pencils, their crayon box, a pair of scissors, a glue stick and their container. This container holds coins for my behavior incentive program and their spelling words for Words Their Way. I do not think they are too heavy, but they aren't light either. 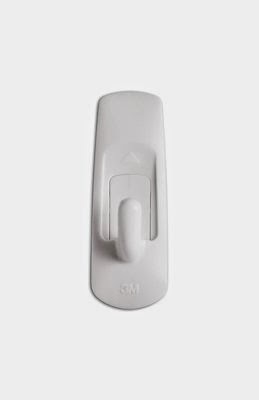 I have only had one command hook come off - and that was my fault. I had a kiddo not have one, so I popped it on, and waited like a minute and put his bag on. BIG MISTAKE. They need 24 hours to really get on there and hold. This will be year three and the only one that has come off was the one I just mentioned, oh and one my son broke by playing with it too much! This is the one pound hook. Just in case you are nervous about it being too heavy. These are the half pound ones. My desks use about half of each kind. Only because I didn't have any more 1/2 lb ones. I think they honestly can hold what you put in. I know most of you probably don't have the twistable crayons. They are on our supply list! They are awesome. no broken crayons on my floor, it is awesome. But that is a separate BI post!!! I had the dreaded bin of log ins. My kids used them for their computer log ins in my classroom, the computer lab, library, and lunch. Some days, they used these lanyards 4 times in one day - hooray double special day! It was NIGHTMARE!!! The first week of school, EVERY kid needs their log ins because they don't use them in kindergarten and this is their first time using a six digit number. The only good thing is that this number follows them until the graduate high school so once they know it, they know it. However my poor sweet firsties struggled so much. Until around Thanksgiving, pretty much every kid with the exception of two or three still needed it. So in the bucket they would go. Then it was the search for their lanyard, and the yarn is tangled, and gross. Then it frayed. Oh my word. I was OVER IT. I had command hooks on my wish list - seriously people, I should have stock in sterilite and command hooks because I probably have 100 hooks in my room - no joke. love them. I made cute little 1 inch numbers and secured those with book tape - hello three years later - and they haven't moved. I am praying they don't paint our classrooms at the end of this year, because I will cry to take these down. Yes, I know a couple are crooked, but it is what it is. 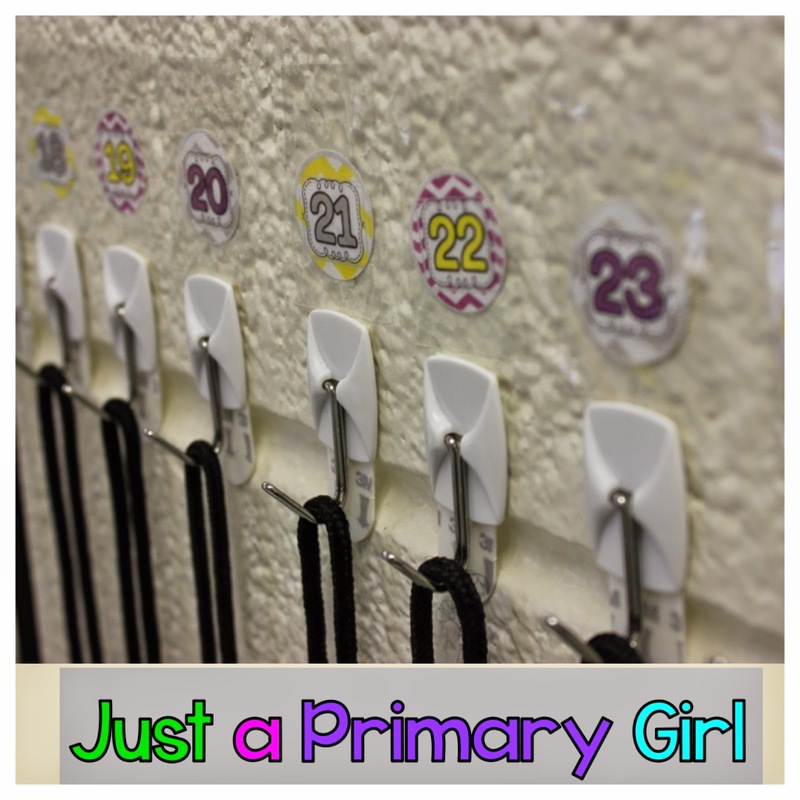 My kids would line up by table to the door, and grab their lanyard off the wall. When they come back, it goes right back where they found it. I did finally invest in the lanyards rather than yarn. I use a bucket of oxy clean and just put them cords in - no the bottom where there is metal to disinfect them over Christmas break and over summer just in case some of my friends decide to chew on them. We have a big discussion about that though. I have used them for three years now, and they have held up beautifully. 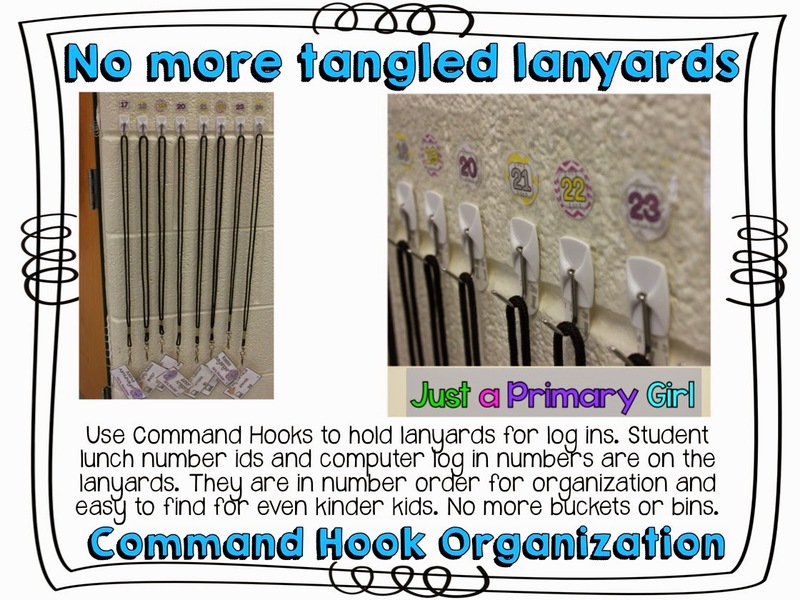 Here is my final command hook bright idea! Under my whiteboard, I have this open space. It can't really be used for much. Last year we adopted bucket fillers. I wanted buckets and not library pockets, and I wondered where I would put them. 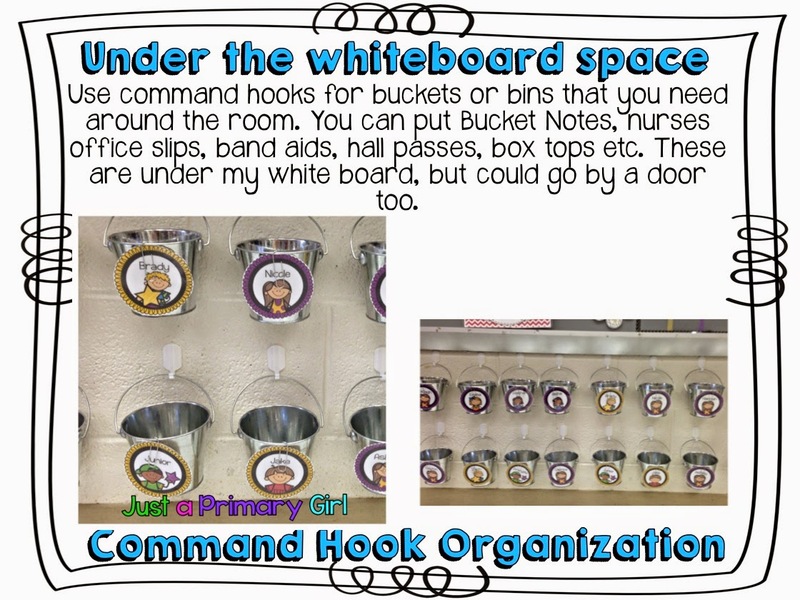 In came my space under the white board and of course COMMAND HOOKS! I had used all my command hooks that I got from my wish list, so I went to Walmart and picked up these cheaper ones. They were $2.00 for 10. Much cheaper than the command hooks, but you get what you pay for. Many of them have fallen down in just one year. I will likely replace them with real command hooks this year from my wish list. 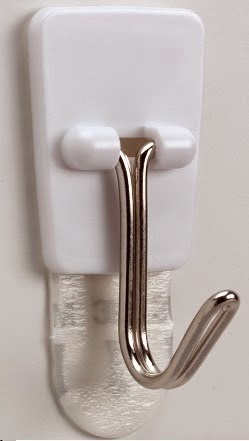 I hope you have found some great bright ideas here - and can use command hooks. Do you use them? do you have another way that you use them in the classroom? I would love to hear about it! For more bright ideas more than 150 different bloggers this month, please browse through the link-up below and choose a topic/grade level that interests you. Thanks for visiting! 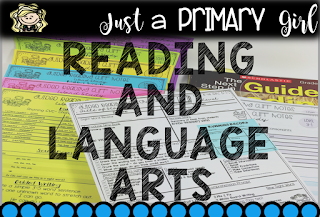 Find other classroom language arts ideas by checking out my pinterest board. Click the picture below. So clever I will be buying a bunch tomorrow. Thanks for the inspiration. Love it!!! Would you share your 1" number circles? Love command hooks! I used them all over my room! I am slowly becoming a fan of command hooks as well. 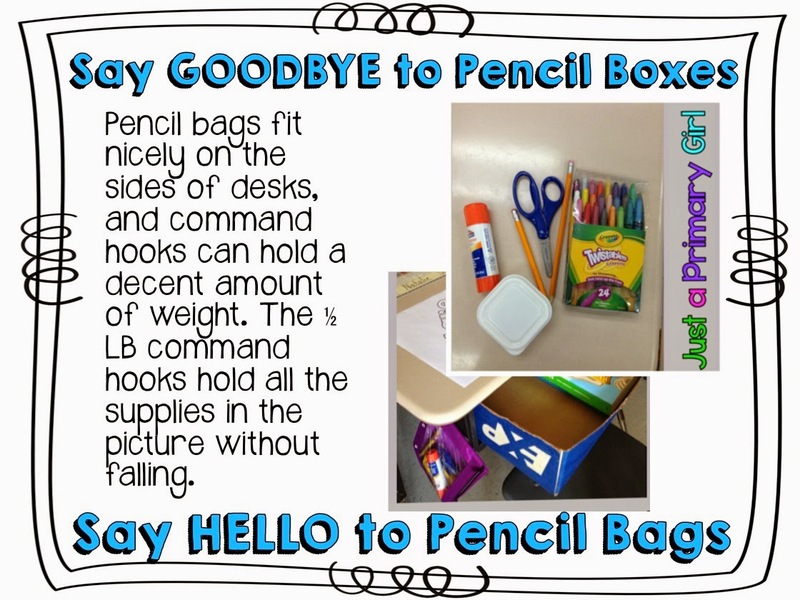 Love the idea of using it for the pencil bags! Do the command hooks work on the painted cement? I thought I've tried that before and it didn't work, but maybe I didn't let them sit long enough first. Also, what is book tape?